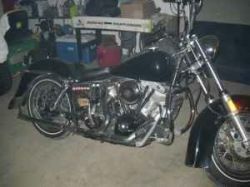 I have my beautiful classic 1980 Harley Davidson Wide Glide for sale that comes with saddle bags. The 1980 Harley Wide Glide has never been wrecked, laid down or dropped or in an accident of any kind. The Harley Wide Glide is located in Mohawk, New York and I would like to get $10,500.00 for it and if you have any questions about the motorcycle please feel free to e-mail me. The Harley for sale has 10,000 original miles and is in factory stock condition. Strike Lightning Used Motorcycles for Sale would like to extend an invitation to anyone who is having problems with a similar make and model to leave their questions or describe the exact problem that you're having and your contact information in the space below and see if somebody who stops by may offer a solution for how to fix your motorcycle. We also encourage bikers to submit their opinions and reviews of the 1980 Harley Davidson Wide Glide for sale to help potential buyers make informed decisions and to benefit the biker community as a whole.